- Shafalus was a man that had truly loved a woman named Procris throughout his life, but was loved by Aurora as well. - Procris gave Shafalus a special dog that could outrun any other and a special javelin that never missed its target. - Shafalus greatly angered Aurora and sometime later she sent out a special fox. Shafalus sent his dog after the fox and after a throw of the javelin, Procris was heard crying with the javelin stabbed into her. She died a while later. 1. "Cephalus." Mythology Guide. 24 May 2008 <http://www.online-mythology.com/cephalus_procris/>. 2. 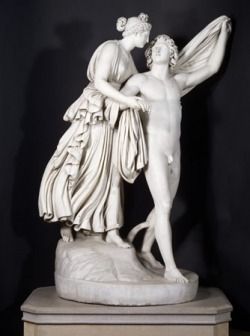 "Larger version of Cephalus and Aurora, 1789-90, by John Flaxman." Lady Lever Art Gallary. 26 May 2008 <http://www.liverpoolmuseums.org.uk/picture-of-month/showLarge.asp?venue=7&id=51>.